We then had a glass of Brut Nature Gran Reserva from Agusti Torello from Cava which was quite elegant. Next, we had a first still white wine: Emilio Rojo 2005 from D.O. Ribeiro, a cuvée of five domestic varietals from Galicia which are Treixadura, Albariño, Loureiro, Lado and Torrontes. I remember it to be a very elegant and smooth wine with a nice balance (I didn’t take any serious notes unfortunately). Our second bottle of white wine was a Nun Vinya dels Taus 2005 from Vinifera D.O. Penedes. It is also made from a domestic grape from Penedes called Xarello and the winery only cultivates a tiny 0.9 hectare parcel with that varietal. It was aged in New and old oak barrels and hence showed a quite oaky nose, which normally is not my preferred style. But together with the food, the wine was quite a good match. Naturally, with the hare and lamb on the menu, we also had a glass of red wine. A 2004 Corullón from J. Palacios in the D.O. Bierzo. It was fruity with a hint of wood only and also a good pinch of freshness. A little astringency though showed us that it was still a bit too young to be drunk. The not too sweet Moscatel MR 2006, also labeled as “Mountain Wine” from the very famous Telmo Rodriguez stems from the D.O. Malaga was a good pre-dessert wine. 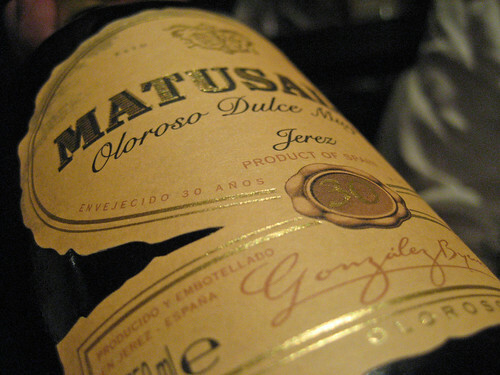 Finally, a terrific glass of Oloroso Dulce Matusalem from Gonzalez Byass closed the meal in a superb way. PS: If you ever plan to have dinner at El Bulli and rather chose the wines on your own, it is a good advice to check the online wine list beforehand. You won’t have that much time at the restaurant, especially with that big of a list.